Maine’s Island Institute, which works to sustain the state’s island and remote coastal communities, focuses on Chimani’s work and products in an extensive profile in its online newspaper, The Working Waterfront. Check it out! How many of us have toiled up a mountain to enjoy the view at the peak in Acadia National Park, only to play the guessing game of what the view is? Even with a paper map, it can be hard to determine which islands or mountains are part of the panorama. 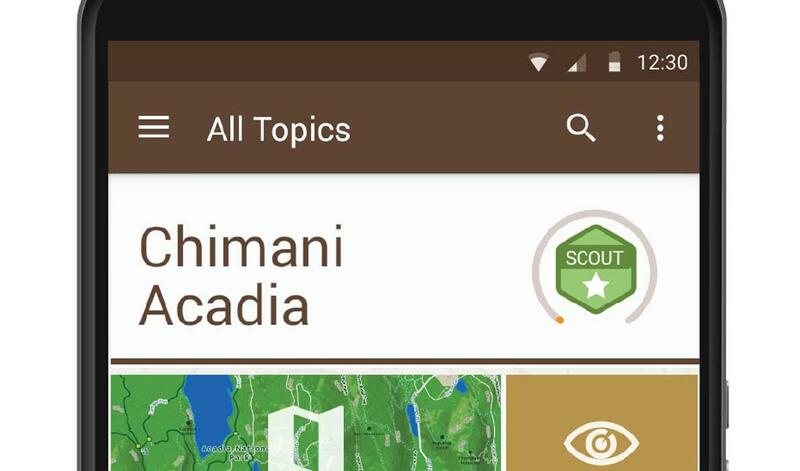 Portland-based Chimani has created a sort of a digital guidebook of an app for Acadia and several other national parks that comes with professional voiceovers and an augmented reality function. Smartphone users can look at the view on the phone’s screen and receive information on each landform or body of water. That feature is just as Chimani founder Kerry Gallivan first pictured the app. Gallivan, a native of western Massachusetts, first came to Acadia on a random road trip while attending Northeastern University; he was drawn to the park regularly after that. He developed dual passions for nature and technology, and worked to bring email systems to remote regions in Africa and Asia, but he had trouble conceiving of a business opportunity to use technology to enhance the experience of a hike. Then, during a hike up Acadia’s Gorham Mountain in 2009, he envisioned how nice it would be to have info on the view at his fingertips, and he thought of his smartphone. “It wasn’t until mobile [smartphones] came around that I saw the opportunity to combine both those passions,” Gallivan said. Gallivan and co-founder Shaun Meredith created Chimani to solve a problem of the digital age. In the past, national park visitors used guidebooks to plan trips and hikes, but they moved away from these books when they grew accustomed to having information available by smartphone. The problem is that many national park areas lack an Internet signal, and many national park websites don’t give the same depth of information as a hardcopy guidebook. Travelers are showing up unprepared at their destination and getting in over their heads on hikes. “You get people who are information paralyzed,” Gallivan said. Chimani is designed to be downloaded beforehand and then used without an Internet signal. It relies on GPS satellite information to pinpoint the user’s coordinates and provide trail and map information, as well as traditional guidebook material. Gallivan and Meredith developed Chimani while they were working day jobs. The original plan for the app, like so many others, was to sell it, first for $9.99, and then for as low as $.99. It had a steady stream of users, but not enough to make a sustainable business. It wasn’t until they offered the app free for a week that it took off. A prominent outdoors blogger wrote about the giveaway and 120,000 users downloaded it. ”At the end of the week, we turned it back to paid, and [downloads] went down to just a little drip. We said, ‘OK, this isn’t the model,’” Gallivan said. The app is now distributed for free and paid for by advertising partnerships, most notably with Subaru. It has been downloaded 725,000 times, with a sizable amount of downloads coming from international tourists. Chimani has grown to a full-time gig for Gallivan and Meredith, and the business now has four other employees and a team of freelancers. Chimani is now partnering with other trail organizations connected to national parks to expand interactive options. For example, it’s working with Friends of Acadia to coordinate a scavenger-hunt-like challenge of hikes. It also has partnered with the Maine Island Trails Association (MITA) to make a custom app that the association can provide its members. Doug Welch, MITA’s executive director, said the association has received very positive feedback about the app, and it has now started offering the option of a discounted digital-only membership. While Welch emphasizes that the enhanced reality feature of the MITA app should never take the place of navigational maps on the water, he says the app does help people distinguish islands from one another. Chimani will continue to expand both locally and throughout the U.S. There are plans afoot to have the Acadia app translated into French and Mandarin, and Gallivan says the business will take part in Acadia National Park’s centennial celebration next year.